India's Central Bank Chief Warns on Market Risks - In a panel discussion hosted by the Wall Street Journal in Davos, Switzerland, Reserve Bank of India Governor Raghuram Rajan said central-bank policies are creating market distortions. Published Jan 29, 2016, WSJ.com. Central Banks Intensify Campaign for Negative Rates - Bloomberg Business: "... negative interest rates ... the Bank of Japan on Friday joined a growing club taking the once-anathema step of pushing some borrowing costs beneath zero ... about a quarter of the world economy now in negative-rate territory, the policy reflects pressure to do even more to ignite inflation at the risk of hurting banks. The lack of fallout so far sets the stage for the European Central Bank to cut rates even more and may fan speculation the Federal Reserve will follow if the U.S. slumps ..."
Joe Scarborough: Cruz and Rubio "had their worst nights" of all the debates. Thursday night? The Fox News - Google GOP Debate had only 12.5 million viewers between 9 and 11 p.m. Eastern, according to Nielsen (source). Anyone thinking Trump loses this game of chicken hasn't been paying attention for the past 6 months. Megan's post-debate show seems like an effort to bury Trump. I feel like #ThisTown hasn’t yet come to terms with the reasonably high probability that Donald Trump is going to become president. Note: In this year of the IANA Transition, Domain Mondo will be monitoring U.S. elections, particularly the 2016 US Presidential Election. This is the second post in a series that began with the #DemDebate on January 17, 2016. 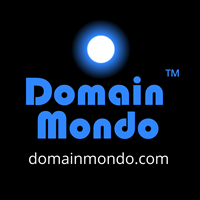 In addition, Domain Mondo now has, and will maintain, an Election2016 page with Twitter feeds and links. Google tax: David Cameron defends £130m UK tax deal - BBC News Google agreed to pay £130m of tax dating back to 2005 to HMRC, which said it was the "full tax due in law". But European MPs have described it as a "very bad deal" and Labour said it amounted to a 3% tax rate. EU mulls probe of U.K. Google tax deal as Italy investigates - San Jose Mercury News: "Ricardo Cardoso, spokesman for EU competition commissioner Margrethe Vestager, said that "we will look into it and then decide where to move from there."" Google has cleverly planted dozens of their people in White House, Downing St, other governments. Most brilliant new lobbying effort yet. Global tech companies making enormous profits most places, funnelling $$ thru tax havens. Unless stopped will ruin local businesses who pay. Google et al broke no tax laws. Now paying token amounts for p r purposes. Won't work. Need strong new laws to pay like the rest of us. Tweets about "Google tax deal"
International Perspectives of the State of Governance on the Internet (56 mins) with Larry Strickling, Assistant Secretary for Communications and Information, United States Department of Commerce, NTIA; and Bertrand de la Chapelle, Director, Internet & Jurisdiction Project. MODERATOR: Cheryl Miller, Director, International Public Policy and Regulatory Affairs, Verizon. The Collapse of the EU Safe Harbor: Assessing the Damage and Exploring Solutions (59 mins) INTRODUCTION: Justin Antonipallai, Counselor to the Secretary with Delegated Duties of Under Secretary for Economic Affairs, U.S. Department of Commerce; PANEL: Andrea Glorioso, Counselor, Delegation of the European Union to the U.S.; Bijan Madhani, Public Policy & Regulatory Counsel, Computer & Communications Industry Association; Meg Jones, Assistant Professor, Georgetown University; MODERATOR: Kelly A. DeMarchis, Counsel, Venable LLP. See also: Europe’s Top Digital-Privacy Watchdog Zeros In on U.S. Tech Giants - The New York Times: ".... A number of digital-rights advocates, including Mr. Schrems, are also preparing new privacy cases if a data-transfer deal is not reached by Feb. 1. That will most likely cause more problems for American tech giants, pushing Ms. Falque-Pierrotin and her European counterparts to consider new investigations — and, eventually, fines. But her position on protecting personal data continues to appear unwavering. “Does the U.S. provide sufficient privacy guarantees?” she said. “Until now, the answer is no.”"
State of the Net - The largest Internet policy conference in the U.S.
Earnings per share (EPS): $1 vs. $1.56 consensus estimate (GAAP). Revenue: $35.75 billion, up 22% year-on-year, vs the $35.9 billion consensus estimate. 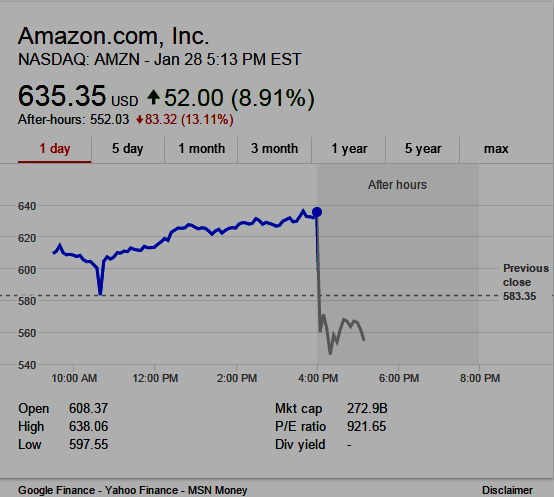 Amazon.com, Inc. (NASDAQ:AMZN) conference call to discuss its fourth quarter 2015 financial results, January 28, 2016, at 2:00 p.m. PT/ 5:00 p.m. ET. Net sales increased 22% to $35.7 billion in the fourth quarter, compared with $29.3 billion in fourth quarter 2014. Excluding the $1.2 billion unfavorable impact from year-over-year changes in foreign exchange rates throughout the quarter, net sales increased 26% compared with fourth quarter 2014. Operating income increased 88% to $1.1 billion in the fourth quarter, compared with operating income of $591 million in fourth quarter 2014. Net income was $482 million in the fourth quarter, or $1.00 per diluted share, compared with net income of $214 million, or $0.45 per diluted share, in fourth quarter 2014. "Financial Guidance - The following forward-looking statements reflect Amazon.com’s expectations as of January 28, 2016, and are subject to substantial uncertainty. Our results are inherently unpredictable and may be materially affected by many factors, such as fluctuations in foreign exchange rates, changes in global economic conditions and customer spending, world events, the rate of growth of the Internet and online commerce, and the various factors detailed below. First Quarter 2016 Guidance Net sales are expected to be between $26.5 billion and $29.0 billion, or to grow between 17% and 28% compared with first quarter 2015. Operating income is expected to be between $100 million and $700 million, compared with $255 million in first quarter 2015. This guidance includes approximately $600 million for stock-based compensation and other operating expense (income), net. It assumes, among other things, that no additional business acquisitions, investments, restructurings, or legal settlements are concluded and that there are no further revisions to stock-based compensation estimates." The event will be webcast live, and the audio and associated slides will be available for at least three months thereafter at www.amazon.com/ir (Amazon Investor Relations). 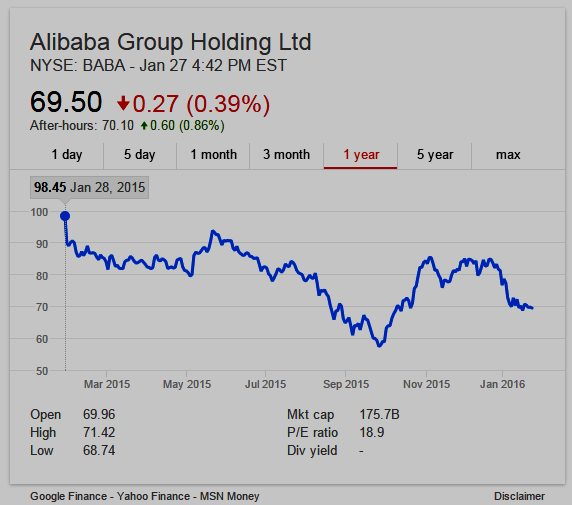 "Alibaba Group's mission is to make it easy to do business anywhere. The company is the largest online and mobile commerce company in the world in terms of gross merchandise volume. Founded in 1999, the company provides the fundamental technology infrastructure and marketing reach to help businesses leverage the power of the Internet to establish an online presence and conduct commerce with hundreds of millions of consumers and other businesses. Monthly active users (MAUs) - MAUs were 1.59 billion as of December 31, 2015, an increase of 14% year-over-year. 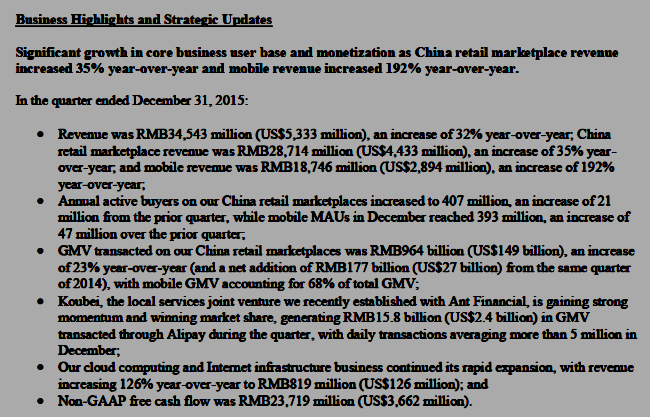 Mobile MAUs - Mobile MAUs were 1.44 billion as of December 31, 2015, an increase of 21% year-over-year. Facebook, Inc. (NASDAQ: FB) fourth quarter and full year 2015 financial results will be released after market close on Wednesday, January 27, 2016. Facebook will host a conference call to discuss its results at 2 p.m. PT / 5 p.m. ET the same day. The live webcast of the call can be accessed at the Facebook Investor Relations website at investor.fb.com, along with the company's earnings press release, financial tables and slide presentation. Following the call, a replay will be available at the same website. A telephonic replay will be available for one week following the conference call at 404.537.3406 or 855.859.2056, Conference ID: 16251646. Facebook uses the investor.fb.com website and Mark Zuckerberg's Facebook Page (https://www.facebook.com/zuck) as means of disclosing material non-public information and for complying with its disclosure obligations under Regulation FD. Published on Apr 8, 2015 - Martin Wolf, chief economics commentator, talks to the FT's Michael Skapinker about China’s economic slowdown and whether there is still reason to be optimistic about its prospects. Or which of ICANN's new gTLDs are the "shadiest" in the global DNS? Above: ICANN 2015 Presentation on "DNS Abuse Handling"
ICANN is currently engaged in data collection on DNS (Domain Name System) abuse and mitigation efforts implemented as part of the New gTLD Program. 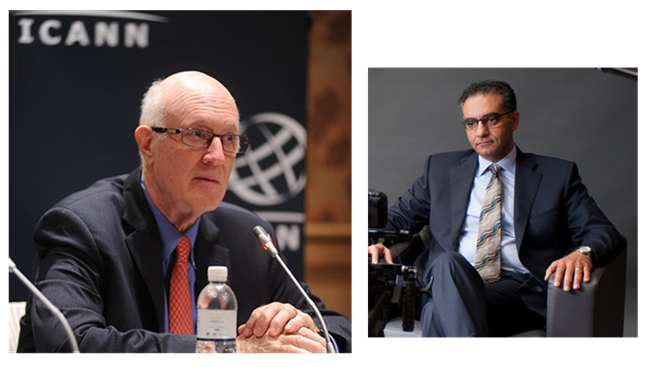 Members of the community and general public are invited to join ICANN on 28 January 2016 in an open discussion on the topic. This work will help inform the efforts of the review team examining the effects of the Program on Competition, Consumer Choice, and Consumer Trust, which will assess the safeguards in the Program as part of its work. Discussions will be conducted in English. Recordings will be posted at: https://newgtlds.icann.org/en/reviews/dns-abuse. Topic 1: Which activities do you consider to be DNS abuse? If you could put forth a globally accepted definition of DNS abuse, what would it be? This definition should be broad enough to cover various malicious uses of the DNS. Topic 2: What are the most effective methods to measure the prevalence of abusive activities in the DNS? Topic 3: As part of the New gTLD Program, ICANN introduced safeguards [PDF, 128 KB] to mitigate potential DNS abuse in new gTLDs (listed below). How can we measure the effectiveness of these safeguards? Topic 4: What has been your experience, personally or on behalf of an organization, with these safeguards? Please tell us: Which were and/or were not effective? How so and why do you believe they were or were not effective? Are there safeguards that should have been included but were not? Any remaining time will be open for questions and related discussion. ICANN's New gTLD Program has enabled hundreds of new top-level domains to enter into the Internet's root zone since the first delegation occurred in October 2013. Comprehensive reviews of the program have begun and will cover a variety of topics including competition, consumer trust and choice (CCT), security and stability, rights protection and other areas. Along with commissioning third-party analyses,ICANN is capturing stakeholder experiences regarding operation of the New gTLD Program and its effects on the domain name industry. Lessons learned as a result of these efforts will help shape future rounds of the program. "Mitigating Malicious Conduct," ICANN, New gTLD Program Explanatory Memorandum https://archive.icann.org/en/topics/new-gtlds/mitigating-malicious-conduct-04oct09-en.pdf [PDF, 128 KB], (3 October 2009). at 2:00 p.m. PT / 5:00 p.m. ET. Listen to the audio webcast - *Live streaming uses Apple’s HTTP Live Streaming (HLS) technology. HLS requires an iPhone, iPad, or iPod touch with Safari on iOS 7.0 or later, a Mac with Safari 6.0.5 or later on OS X v10.8.5 or later, or a PC with Microsoft Edge on Windows 10. FinTech is experiencing tremendous growth | TransferWise Blog: "As reported by Business Insider, FinTech startups enabling services like peer to peer money transfer and lending services are on the rise. The first shows the amount of funding FinTech startups have received over the past 5 years. Investments in Q2 2010 made up less than $1 billion, in Q1 2015 they’ve risen to nearly $3 billion..."
Send Money to United States | Cheap Money Transfers to United States | TransferWise: "Banks charge hidden charges when you send money abroad. With TransferWise you save up to 90%. Problem solved, money saved." TransferWise - Wikipedia: "TransferWise is an Estonian developed and UK-based peer-to-peer money transfer service launched in January 2011 by Kristo Käärmann and Taavet Hinrikus with headquarters in London and offices in Tallinn and New York. More than £3 billion has been transferred through TransferWise. TransferWise supports more than 300 currency routes across the world." TransferWise Wants To Take Over The World | TechCrunch: "This year, TransferWise also raised $58 million from Andreessen Horowitz and existing investors. And Hinrikus thinks his company is in a great position right now when it comes to competition from other startups. “I think it’s a very highly defensible business. It’s very hard to build a brand online,” he said. 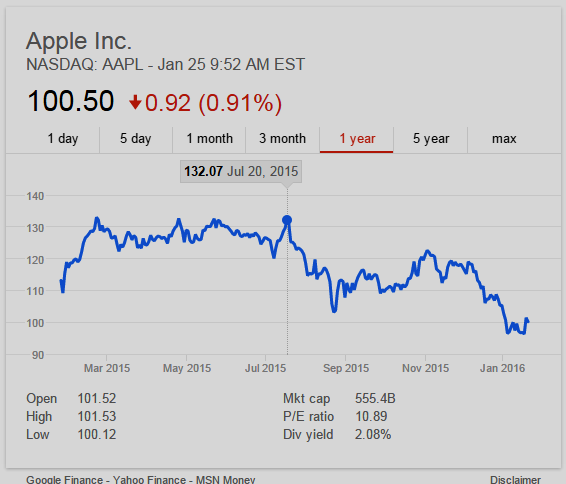 “I challenge you to find another financial startup that has a 5 percent market share. Making sure that we move tens of millions every day is hard as well. I’m actually feeling pretty good.”"
Andreessen Horowitz tried to invest $10 million in TransferWise's 2013 Series A - Business Insider: "TransferWise announced in June that it is now transferring £500 million ($762 million) a month and has transferred over £3 billion ($4.5 billion) since launch." Goldman Sachs chart on TransferWise cost - Business Insider: "TransferWise's fees when sending money from the UK to Germany are sub-1%, compared to over 3% at a Western Union and over 4% for High Street banks." • Move over Donald Trump! ICANN CEO Fadi Chehadé shows he too has perfected the "art of self-promotion" albeit on 'ICANN's dime'--UPDATE: Fadi "bags" another one, on ICANN's dime, to add to his "Portfolio" -- What To Do With ICANN CEO Fadi Chehade? -- Should ICANN President & CEO Fadi Chehade Be Fired? Questions: Will IETF or IETF Trust, or subsidiary, eventually run IANA, and assess each TLD an annual fee plus transactional fee per change to the Root Zone file? Could ICANN be abolished? And see Starbucks' (SBUX) CEO Howard Schultz on Q1 2016 Results - Earnings Call Transcript | Seeking Alpha: "... I think we said three years ago publicly that we began to envision that there would be a seismic change in consumer behavior and that seismic change was due in large part to eCommerce and smartphone shopping. I think today in the headlines you've seen just in the last three weeks store closures of almost 50 Macy's stores, 150 Walmart stores. You've got to ask yourself what's going to happen to the future of many of those malls that are anchored by those big-box retailers..."
Barry Ritholtz interviews Bill Janeway on this edition of Masters in Business (Audio released January 3, 2016) by Bloomberg View: “IPOs are the new down round" says Venture Capitalist Bill Janeway. Janeway is a managing partner at Warburg Pincus (warburgpincus.com) and author of Doing Capitalism in the Innovation Economy: Markets, Speculation and the State. He attended Princeton undergrad, and earned his Ph.D. in economics from Cambridge University on a Marshall scholarship. Known as a “key creator of modern venture capital,” Janeway helped to created BEA Systems, which connected software applications to databases across much of the Internet. The initial cash investment of $54 million became a payout of $6.5 billion within six years. His work operates at the intersection of technology, finance, and economics. Janeway funded the Cambridge Endowment for Research in Finance in 2001 and funded the annual Princeton-Cambridge Finance Seminars in 2004. The Secret to Successful Mobile Games, According to Atari's Ex-CEO - Nolan Bushnell, *NeoEdge Networks chairman and former Atari chief executive officer, discussed the funding environment for tech startups and the secret to successful mobile games with Bloomberg's Betty Liu on "Bloomberg Markets," November 6, 2015. *NeoEdge Networks | CrunchBase: "Acquired by Double Fusion (which is now closed) on December 14, 2011; Total Equity Funding $10M in 3 Rounds from 4 Investors; Headquarters: Toronto ... NeoEdge Networks is a tech and in-game ad company that enables casual game publishers and developers to deliver TV-like commercials." The parallels between the financial industry and the domain name industry are interesting--take note particularly (begins @37:00) the public role of banks and financial institutions as regulated utilities, with duties to act as extensions of law enforcement, required to collect and analyze data, report "suspicious" patterns and transactions, even closing customer accounts, etc.--if you want an insight into the future of the domain name industry and internet governance, watch this video. 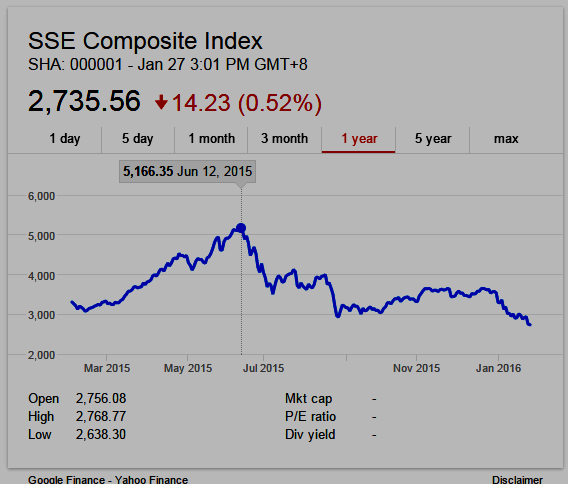 “Putting all of this together, global growth in 2016 will be disappointing and uneven. The global economy’s medium-term growth prospects have weakened as well, because potential growth is being held back by low productivity, aging populations, and the legacies of the global financial crisis. High debt, low investment, and weak banks continue to burden some advanced economies, especially in Europe; and many emerging economies continue to face adjustments after their post-crisis credit and investment boom. The Future of the Global Financial System is a World Economic Forum Global Challenge. The challenge – how to create a resilient, accessible financial system that people trust. It’s an interesting time for finance, says moderator Gillian R Tett. In 2007, bankers were on top of the world, holding their heads up high. Then, the crash, and since then many of the panels here in Davos have been dominated by what went wrong and what could be done to make things safer. Now, the discussions are forward looking, with less focus on regulation and more attention on fintech and the changes – both positive and negative – that are happening in the world of finance. The biggest challenge, argues Tett, isn’t a crisis in regulation, but the new players. Although regulation has moved out of the spotlight, there is still work to be done in this area, argues Christine Lagarde. There are issues between the US and Europe around over-the-counter derivatives and clearing systems which are not progressing at the speed at which they should. These areas need more regulation, says the IMF head. Basic retail banking is changing, Lagarde goes on to say. It’s being disrupted by innovations and there are people now who have never been – never had to – go into a bank. But this is merely another way of doing business. Virtual currencies and blockchains, on the other hand, can cause deeper disruptions. They may be relatively small (the current value of virtual currencies is around $7 billion), and may be nothing to worry about. They could also turn out to be beneficial – in reducing costs, providing better value and reaching the unbanked. But they could also a great instrument for crime. There is the potential for financing terrorism and the illicit economy, and they could disrupt monetary policy. The IMF has today released a report on this topic: Virtual Currencies and Beyond. Will cash exist in the future? The consensus is that, in 10 years, cash will no longer exist. Why? Because it’s inefficient, unnecessary and plays a key role in the illicit economy. Money is definitely digitizing, cheques are disappearing. But let’s not forget that 85% of global transactions are still made with cash. Mobile is exploding across the world. Soon everyone will have a smartphone and hold the power of a bank branch in one hand. This allows the industry to think about consumer transactions in an entirely different way, and it brings in billions of people. The amount of data is exploding, and it’s not going to stop. Algorithms are the weapons of the digital company, and the ammunition is data. The better the quality of this data, the more value it is to the consumer. Security and privacy are genuine concerns, but data is going to change value propositions. Industry lines are blurring, and product lines are blurring. Take digital payments – which involve tech companies, mobile carriers, handset manufacturers and merchants. Security – something Schulman thinks about every day. There is so much data, and authentication is therefore very challenging. Are regulators ready for this transformation? Tom de Swaan argues that regulators first need to define, what are they going to regulate? Privacy? The movement of data? The financial world is still rebuilding trust with consumers, and doing this while convincing them we need their data to create new products is a huge challenge. The regulatory environment also needs to be globally applicable. Schulman: What are we trying to regulate, he asks? Let’s not look back at what happened, but what is likely to happen in the future. He thinks it’s likely a major hack could happen, but innovation needs to be responsible and we need to be able to try new things without worrying about over-regulation. Lagarde supports Schulman’s idea of a “sandbox” to try new ideas, as this would help us to deal with trust and limit any damage to consumers. She doesn’t entirely agree, however, with John Cryan’s suggestion that regulation is made by policy-makers, rather than the regulators themselves. Governments do participate, she says, but the decisions are still being made by the likes of the Financial Stability Board and the Basel Committee, and then channelled into the regulatory system. For bad or for good, the profession still has a lot to do with how supervision is defined. Gorman believes that cyber-security issues need to be addressed. At the heart of the banking system, he says, is trust. When this goes, people want their money back, but the banks don’t have this money, they’ve given it to someone else, and this is what caused the 2008 crisis. What about the future of blockchains? Cryan does not see this sector growing too quickly in the next 4-5 years. Banks are better prepared to manage cash flow of debt and are able to gain insights regarding the credit worthiness of debtors better than someone who can’t access this knowledge. WEF 2016: The future of the European Union. The Prime Ministers of France, the Netherlands and Greece plus the German Finance Minister on Europe's many challenges. George Soros Says He Expects Hard Landing for China Economy - Bloomberg Business: "Billionaire investor George Soros said China’s economy is heading for a hard landing and will contribute to global deflation. "A hard landing is practically unavoidable," Soros said on Bloomberg Television from Davos. "I’m not expecting it, I’m observing it. China can manage it. It has resources and greater latitude in policies, with $3 trillion in reserves."..." How Much Will Markets Fall? Top Investors See No Bottom Yet - Bloomberg Business: ""I expect a protracted decline in the S&P 500," Jeffrey Gundlach, co-founder of DoubleLine Capital, said in an e-mailed response to questions. "Investors should sell the bounce-back rally which could come at any time."" World Economic Forum Annual Meeting 20-23 January 2016 Davos-Klosters, Switzerland - The theme of this year’s Meeting is ‘Mastering the Fourth Industrial Revolution’. Plenary Hall (English) - Davos 2016 on Livestream: " Plenary Hall (English) - Davos 2016 Politics & Society / Global Issues Tue, Jan 19 2016 11:00 AM CST — Sat, Jan 23 2016 11:30 AM CST"
Sanada (English) - Davos 2016 on Livestream: "Sanada (English) - Davos 2016 Politics & Society / Global Issues Wed, Jan 20 2016 2:00 AM CST — Sat, Jan 23 2016 8:00 AM CST"
World Economic Forum on Livestream. : "World Economic Forum The World Economic Forum is an independent international organization committed to improving the state of the world by engaging business, political, academic and other leaders of society to shape global, regional and industry agendas." 2016 World Economic Forum | Reuters.com: Live coverage of the 2016 WEF in Davos, Switzerland. 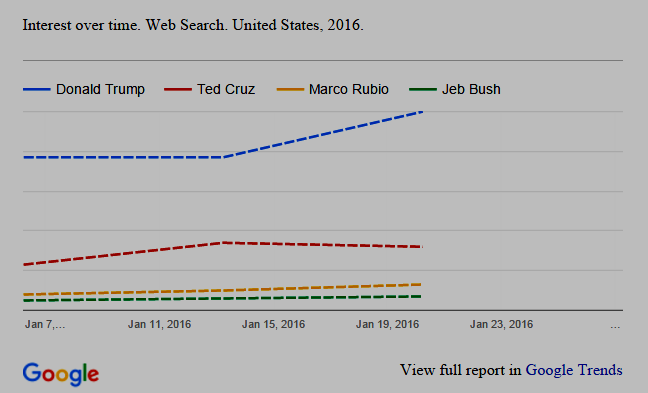 UPDATE Jan 22, 2016: Move over Donald Trump! ICANN CEO Fadi Chehadé shows he too has perfected the "art of self-promotion" -- Fadi "bags" another one, on ICANN's dime, to add to his "Portfolio"--FADI CHEHADÉ ANNOUNCEMENT - Press release | World Economic Forum: "Geneva, Switzerland, 22 January 2016 – The World Economic Forum, the international organization for public-private cooperation, today announced that Fadi Chehadé, outgoing President and Chief Executive Officer of the Internet Corporation for Assigned Names and Numbers (ICANN), will join as senior advisor to the Executive Chairman ..." -- for more "background" see DomainMondo.com: LIVE video: World Economic Forum NETmundial Initiative and After Wuzhen, Should ICANN President & CEO Fadi Chehade Be Fired? After a prolonged silence following the negative reactions to the ICANN CEO's Wuzhen shenanigans, a Monday blog post on the ICANN website by ICANN Board Chairman Steve Crocker indicates how ICANN has been dealing with, and will continue to deal with, the current ICANN CEO, until he leaves, as agreed, on March 12, 2016. "Our search for the next CEO is proceeding ... though I cannot say much more now"
The title of the post and opening paragraphs disclose that the ICANN Board's priority and focus is selection of the next CEO of ICANN, not the antics of the person who currently holds that title. "[T]he ICANN organization continues its energetic pace of work"
Rather than be distracted by the embarrassing and inappropriate conduct of the ICANN CEO at Wuzhen, it will continue to be "business as usual" for ICANN staff and the ICANN organization. "Fadi Chehadé our President and CEO who will be with us until March 12, 2016"
Fadi Chehade will not be fired (termination of the ICANN CEO at this critical juncture in the IANA transition could raise red flags indicative of the true depth of ICANN's flaws and dysfunctions), but make no mistake, Fadi Chehade will not be ICANN President and CEO after March 12, 2016. "Fadi has a full run up to his final day and his last meeting, ICANN55 in Marrakech ... last week Fadi was in Washington D.C. and New York meeting with media, think tanks, stakeholders and the NTIA to discuss the IANA Stewardship Transition. Fadi will be continuing the engagement and briefings on the transition leading our delegations to the World Economic Forum in Davos this week and the Mobile World Congress in Barcelona in February"
The ICANN Board will keep Fadi very busy, on a tight leash, and out of the ICANN offices in Los Angeles as much as possible, through March 12, accompanied at all times while outside the U.S., by 'our delegations' (i.e., 'adult supervision'). "Fadi has informed the Board of his future plans once he leaves ICANN and that there may be one or two additional announcements with respect to part-time advisory roles in the global Internet governance space in the coming weeks"
Fadi has agreed to keep the ICANN Board fully informed and apprised of his future plans--there will not be any more surprise announcements by Fadi via his ICANN President Twitter account like he made in Wuzhen. Let's all keep the main thing the main thing, and not be further distracted by Fadi Chehade. After Wuzhen, Should ICANN President & CEO Fadi Chehade Be Fired?